Citadel of Ho Dynasty (also called Tay Do castle or Tay Giai castle) is a citadel in Vietnam, constructed by the Ho Dynasty (1400-1407). It is located in Tay Giai commune, Vinh Loc District, Thanh Hoa Province. The citadel buildings represent an outstanding example of a new style of Southeast Asian imperial city with a combination between the Vietnamese architecture and the unique building techniques of Viet Nam, Southeast Asia and Eastern Asia. It was inscribed on UNESCO World Heritage Sites on June 27, 2011. The Citadel of Ho dynasty is located in the west of Vinh Loc District, Thanh Hoa province, between Ma river and Buoi river, border with 7 communes (Vinh Tien, Vinh Thanh, Vinh Long, Vinh Yen, Vinh Quang, Vinh Ninh, Vinh Khang) , Vinh Loc Town, a part of Vinh Phuc commune (Vinh Loc district) and a part of Thach Long commune (Thach Thanh district). It is rectangular in shape. The north-south side is 870.5 m (2,856 ft) in length and its east-west side is 883.5 m (2,899 ft) in length. There are four gates: one at the south (fore gate), one at the north (back gate), one at the east (left gate), and one at the west (right gate). The southern gate is 9.5 m (31 ft) high and 15.17 m (49.8 ft) wide. Surrounding the Citadel are a lot of relics like exhibition house, Nang Cave and An Ton Mountain, temples of Binh Khuong, Giang pagoda, Ho Cong cave, Dong Mon Communal house and so on. Inside the citadel are Thanh Noi (Inner citadel), Hao Thanh, La Thanh and Nam Giao Alter. - Thanh Noi (Inner Citadel): Thanh Noi is the main architectural work of the citadel, also known as Imperial Citadel with the remains of the royal palaces and temples inside. It is fairly square with about 870.5m long north and south sides, 883.5m long east and west side.. Thanh Noi has four domed gates called the South, North, West and East (or also known as the Front, Back, Left and Right gates), each located at the centre of each side. The Front Gate in the south is the most important and has three entrances. According to the documents, there were palaces in the Thanh Noi such as Hoang Nguyen, Nhan Tho, Phu Cuc, Dong Cung, Dong Thai Mieu, Tay Thai Mieu, Diem Canh… However, now Thanh Noi remains some relics such as a part of the citadel’s wall and four gates, vestiges of lakes, a couple of stone dragons with sophisticated carving features, foundation of Thanh Noi architecture, Hoa Nhai marble-paved road, stone balls, stone bullets, pottery, the Southern gate precinct and valuable objects with specific characteristics of Tran - Ho dynasties culture. - Hao Thanh: Hao Thanh is the system of water trench surrounded the Thanh Noi and connected with Buoi River through a canal at the southeast corner of the citadel. - La Thanh: the outer wall of the citadel built to protect the Thanh Noi was home to residents in the citadel. It was approximately 10km in perimeter and its construction based on the natural terrain. 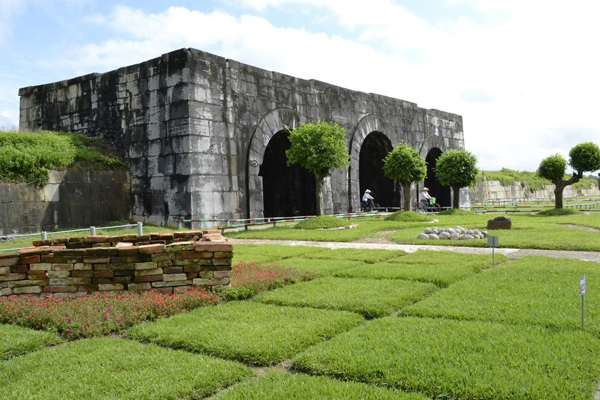 - Nam Giao Altar: It is located in the southwest of Don Son Mountain, on the spiritual pathway directly connected with the South gate of Thanh Noi, about 2.5km away from the citadel of the Ho Dynasty to the southeast. This is the place to sacrifice to the heaven; pray for harmonious rain and wind, peaceful country and happy people, prosperous and everlasting dynasty.